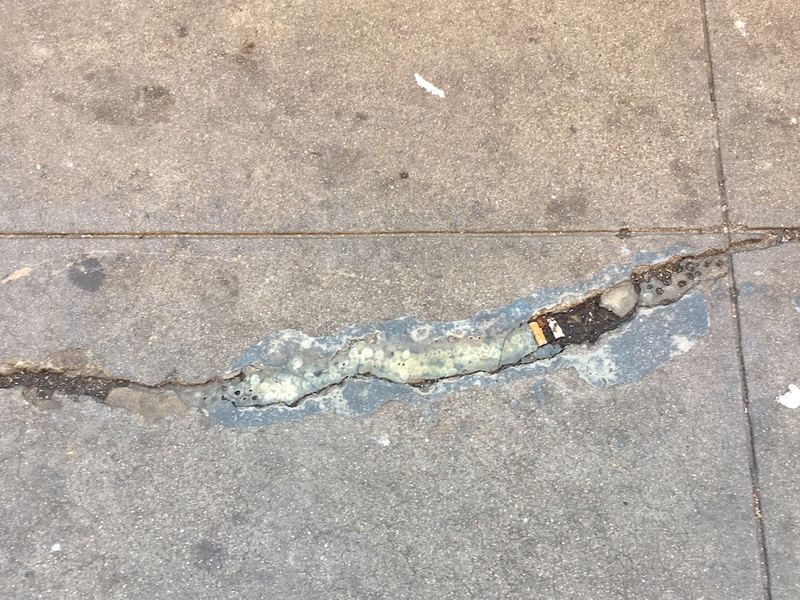 Potholes are an unpleasant fact of city life, but one Tenderloin artist is turning the neighborhood's fissures and gaps into underfoot artwork. Since his partner suggested the idea two years ago, Rik Lee Leipold has used acrylic resin and found objects to create 25 different installations that each evoke geo-specific memories and reminders. 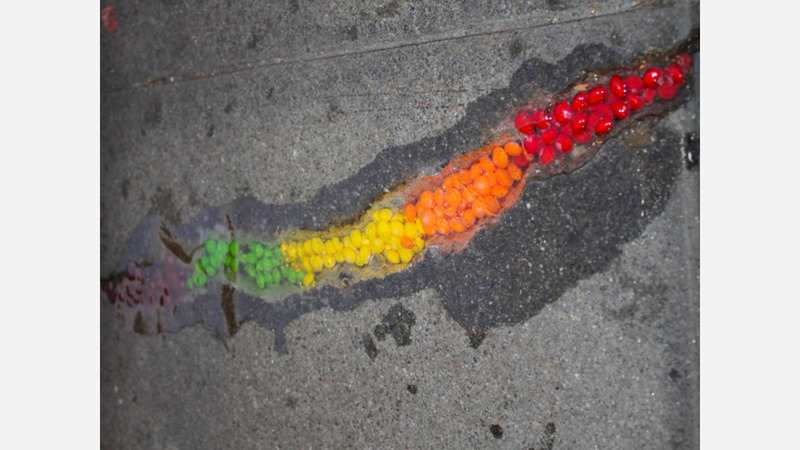 On Geary near Larkin Street, Taste The Rainbow was filled with Skittles to reflect the neighborhood's history as an LGBT enclave. After more than a year of foot traffic, the piece has faded, shrunk and started working free of the crevice it calls home. "I've thought of going back and replacing the ones that pop out with acrylic Skittles, as a preservation effort of sorts," said Leipold. His installations started out as a hobby but he now sees them as part of a visual narrative that helps residents and visitors relate to the neighborhood. Most recently, Leipold commemorated San Francisco's oldest gay bar, the Gangway, on the sidewalk just outside the bar, which closed in January. 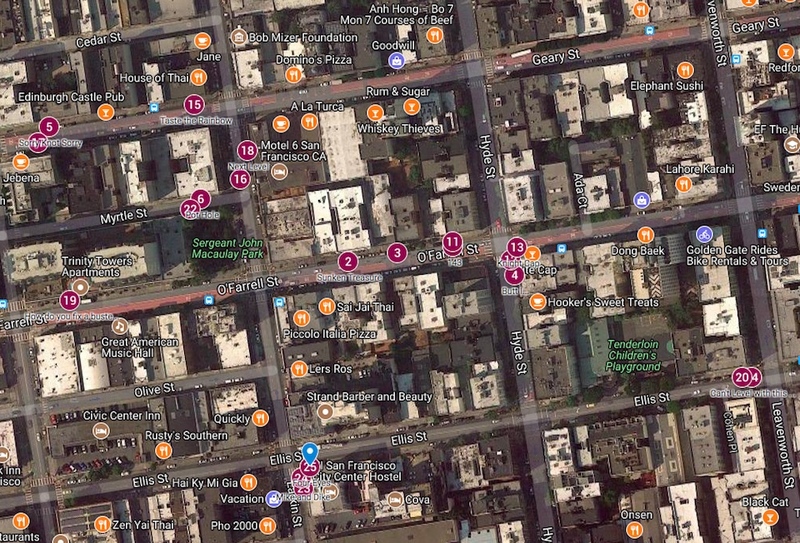 The space is set to become a kung-fu themed laundromat and bar in the coming months, but there is an effort to relocate the Gangway to another space in the neighborhood. 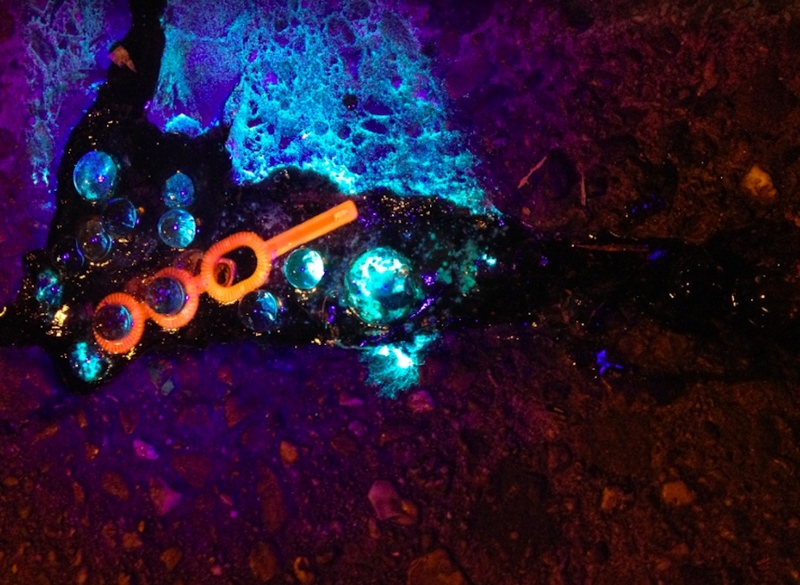 Leipold often uses black light-reflective paint on the objects he includes, but the Gangway installation is the first pothole to incorporate LEDs, he said. He mixes the resin on site and often only fills potholes partway so he can return to add things later. 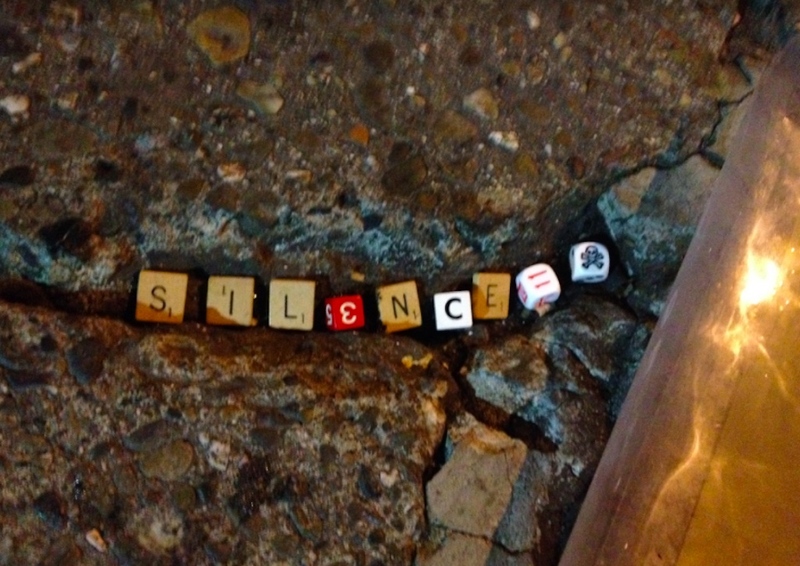 Last year, he was working on a piece called Silence Equals Death just outside of Aunt Charlie's last year during an afterparty when DJ and transgender activist Bubbles came out and asked to join in. Leipold memorialized his sister in a pothole just outside his apartment. After Bubbles was killed in September, Leipold returned to the site and added a bubble wand, some acrylic bubbles and pink whippets to memorialize Bubbles' personality, he said. When his sister passed away last year, Leipold found a large pothole near his apartment and memorialized her favorite dial-pad pattern--'143' for 'I love you'--along with other items that remind him of her. A Google map listing Leipold's installations. "I use that as my practice pothole, I am always adding to it," Leipold said. 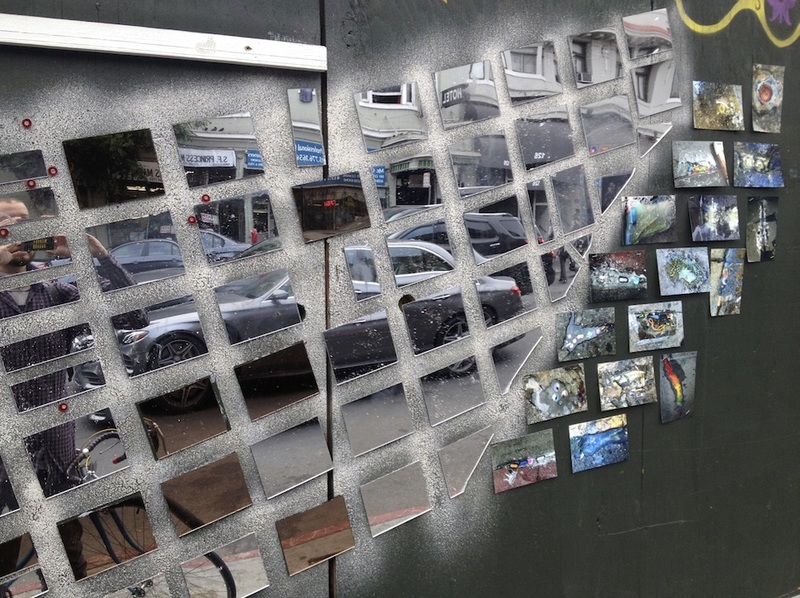 He has used a broken disco ball and silver gnome to commemorate Deco, a gay bar that once held dress-up karaoke nights in a space on Larkin Street that now houses Emperor Norton's Booze Land. Along with preserving history and memories, Leipold combines custom-made trolls and candy to attract kids' attention by adding some childishness to the often grungy sidewalks. "I can't imagine what it is like growing up in a neighborhood like the Tenderloin," said Leipold, who has lived in the area for eight years. Recently, he rented got a storage unit for tackle boxes full of random items that might make good inclusions in his installations. Despite the care an attention each one received, the artist said he accepts that they may be destroyed, removed, or paved over. 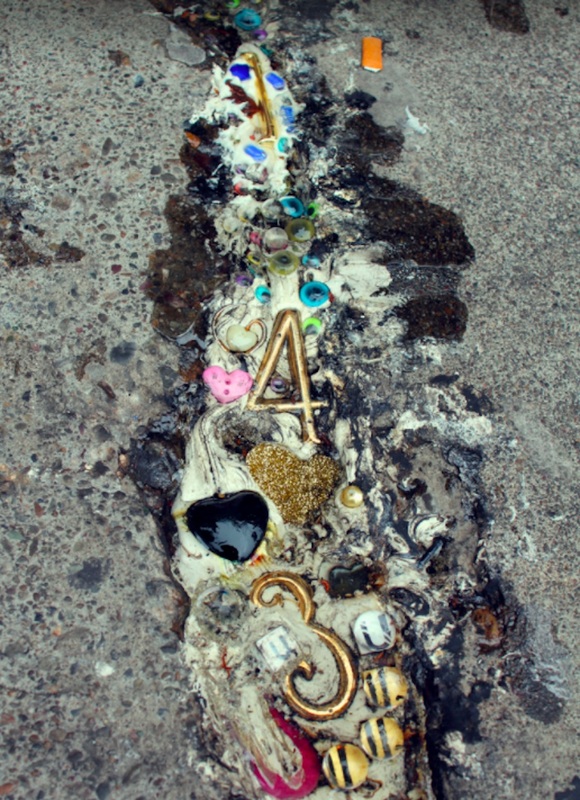 'Sunken Treasure,' a pothole on O'Farrell near Larkin Street, included a miniature treasure chest and gold coins, but was paved over with fresh cement in a sidewalk that Leipold recently saw being broken up for replacement. "I wonder if the workers actually found that sunken treasure," he said. Leipold hopes to design a map that shows his installations in conjunction with other artists and neighborhood support systems--city services, parks, and green spaces--to display at a gallery and issue in book form. To see more of Leipold's work, browse his Instagram, or use the Google map he created to find his works around the neighborhood.